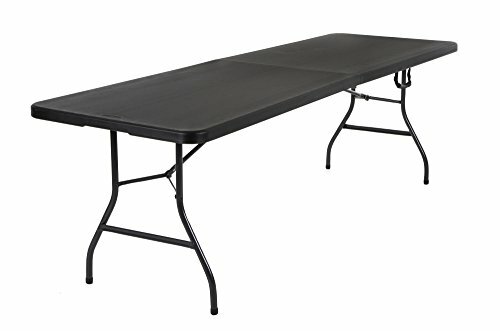 Cosco Deluxe 8 foot x 30 inch fold-in-half blow molded folding tables cater to any event. Dress them up for the holidays or take them outside for a barbecue. This table features a waterproof top that resists spills and weather. The versatility of this table saves space and time with legs that fold in and a center folding feature that makes transport and storage virtually effortless! this table has a heavy duty strong steel frame, steel legs, and a low maintenance, sturdy easy to clean top. Non-marring leg tips complete this table to ensure floors are not scratched or scrapped during use.